Multiple layers design provides a Large Capable Storage as your want. Fit for your IPad mini, Kindle, GPS, makeup, passport, memory SD cards, mini cameras, smartphones, power bank, phone charger, headphones, SD card different kinds of cable, laptop adapters and small accessories. The main part is adjustable padded dividers compartment fit for your different need,well protect your beloved stuffs. A mesh pocket in the upper side for Cards Passport Holder, iPad pouch and iPad mini pouch. 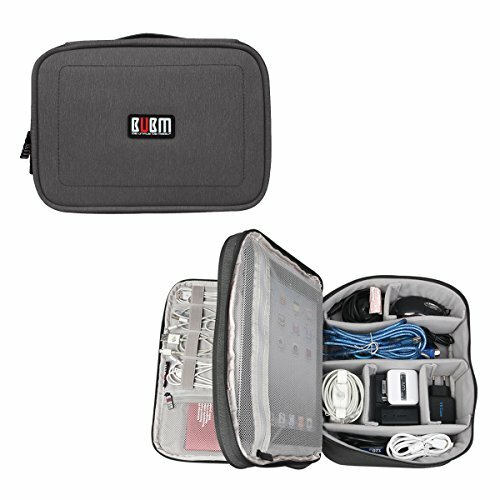 A lot of people purchase BUBM Electronic Organizers for some outdoor activities especially good product for traveling. Middle: 10.8" x 8.3" x 3.1"
Large: 11.4" x 9" x 3.1"
Ideal size easily fits into your luggage, suitcase, flat handle is easy to carry. Multipurpose organizer, can be used as a travel electronic accessories storage bag, business bag, make-up organizer bag, work bag, first aid bag, etc..
Colour: Black, Dimension: 11.4" x 9" x 3.1", Weight: 1.15lb. Internal protective padded, With Handle and zipper open. Material: Exterior materials include heavy-duty, durable and waterproof nylon, brand zipper. Construction: One large internal zipped mesh pocket in the cover. Internal flex wall for electronics accessories storage, adjustable padded Dividers. Excellent Protection: Well padded semi-flexible covers and lining offer excellent protection for your Gadgets. Multi-Function: Home Outdoor Travel Organizer, can be used as Handbag for cables, external driver, flash drive, basic first aid items, several USB cables, scissors, make-up, passport, memory cards, GPS, mini cameras, smartphones and more. View More In Electronic Organizers. If you have any questions about this product by BUBM, contact us by completing and submitting the form below. If you are looking for a specif part number, please include it with your message.